Batteries power all digital cameras in the market today, and Bigshot is no different. However, unlike any other camera, Bigshot also comes with a manual power generator that lets you take photos even when the battery runs out of charge. Figure 1 shows the components of Bigshot’s power generator. The dynamo, seen at the center, is an electric generator similar to those that power our homes. When a user turns the hand crank, the dynamo converts the mechanical energy of that rotation into electrical energy. For the dynamo to generate enough power for Bigshot to take a photo, the crank must be spun at thousands of rotations per minute. Turning the crank at such speeds with your hand is impossible. Therefore, instead of directly connecting the crank to the dynamo, the camera uses a gearbox in between. The gearbox spins the dynamo at very high speeds, even when the user rotates the crank slowly. The electrical energy produced by the dynamo is stored in a rechargeable battery. Each time a photo is taken, the camera draws energy directly from the battery. Once all the energy is used up, the battery can be recharged by cranking the dynamo again. 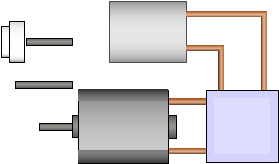 Click on the play button in Figure 1 to see how the rotating hand crank drives the power generator. Use the slider to control the rotation speed.